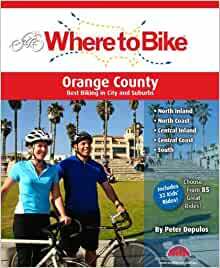 Where to Bike Orange County, is a cycling guide to the county for recreational cyclists who want to know more about fun interesting places to ride their bikes for family time, fun and fitness. Cycling is booming. It's free, healthy, environmentally friendly, sustainable and most of all it's fun. But Where to Ride? Where to Bike Orange County contains 50 interesting rides for adults and 30 kids' rides for toddlers and beginners. There's also a section covering how to prepare and what to take with you. This ride travels mostly through residential neighborhoods and there are few dining opportunities along the route. However, where the ride crosses Yorba Linda Boulevard, there are a number of eateries nearby, Polly's Pies being my favorite, located at 18132 Yorba Linda Boulevard.